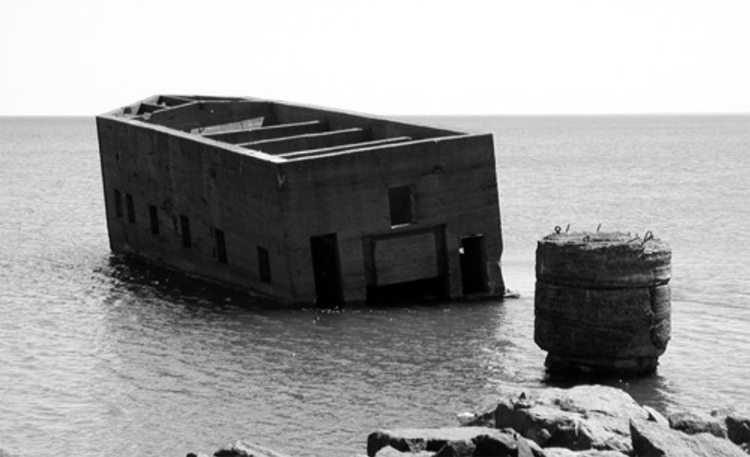 Many dramatic theories have been proffered about the original use of the concrete ruins that lie about thirty yards into Lake Superior just off the Lakewalk behind some of Canal Park’s hotels, used today by scuba divers and adventurous folks who swim out to the concrete ruin and use it as a diving platform. It is also home to nesting ducks. One story claims it was a prohibition-era gambling house. Federal lake charts identify the ruins as “the cribs,” but it is more popularly known as “Uncle Harvey’s Mausoleum.” The truth is neither glamorous nor grim. “Uncle Harvey” was Harvey Whitney, one of the Whitney brothers of Superior. Built in the winter of 1919, the “mausoleum” was no burial site but rather a sand and gravel hopper that was abandoned in 1922 after another of Duluth’s building booms reached its end. Harvey Whitney had gambled that the city of Duluth would revive efforts to build an outer harbor breakwater, and he hoped to provide the materials. Whitney may have been anticipating the construction of Lakeshore Park, known today as Leif Erikson Park, Lakeshore Park was originally designed to stretch from today’s Rose Garden to the corner of the lake, which would be partially filled in and developed with tennis courts and football and baseball fields. The plans, obviously, were never completed. Since demand never materialized, Whitney’s operation shut down. The hopper was abandoned in 1922. Like the breakwater and Citizen’s Dock, it was allowed to sit in the lake. Unlike those other, wooden structures, it did not wash away. The column also may have had a steel jacket at some point, Richardson said, based on his underwater observations. He said the water is about 12- to 14-feet deep in that spot, so the column probably is lying on the lakebed. The [gravel hopper] may face a similar fate someday; it already has a list that has become more pronounced in recent years. Richardson said that his dives on the structure have revealed that the bottom crib is buckling in one corner. He said it doesn’t appear to be in imminent danger of sinking further, but noted that someone with more engineering expertise would be needed to make an official determination.